Many warehouses could benefit from greener energy solutions but can't afford to invest in costly upgrades or systems. Michael Koploy of Warehouse Management Systems Guide interviewed several experts to create this list of energy-efficient retrofits that stay within budget and yield big savings on energy bills and environmental impact. Older roofs tend to absorb heat and contribute significantly to energy bills. A cost-effective alternative to roof replacement is to coat the roof's surface with a highly reflective paint to reduce heat absorption. If the roof is nearing end of life, a number of green roofing options exist that are suitable for warehouses. Increasing natural light cuts back on the need for artificial lighting during daylight hours. Solar light tubes can be installed to provide overhead daylight in strategic locations and with minimal impact to roofing. Metal halide lighting, once the industrial standard, now has competition from fluorescent and induction alternatives. Induction lighting is the most efficient and has dropped enough in price to be cost-effective for many warehouses. It is ideal for spaces where lights need to be turned on and off in very cold temperatures or where fixtures are difficult to access. A cheaper option is the latest fluorescent lighting technology, which has evolved to the point of being safe and practical for warehouses. Some warehouse areas may be well suited to task lighting located near workers rather than expensive overhead lighting. Several fluorescent task-light locations could save considerable money if replacing metal halide wide-area lighting. Another approach is to control the operation of existing lights by installing motion or daylight sensors. Motion sensors turn lights on and off according to movement in the area. If an area needs to be kept lit, daylight sensors adjust the brightness of the artificial lighting according to the ambient daylight present. 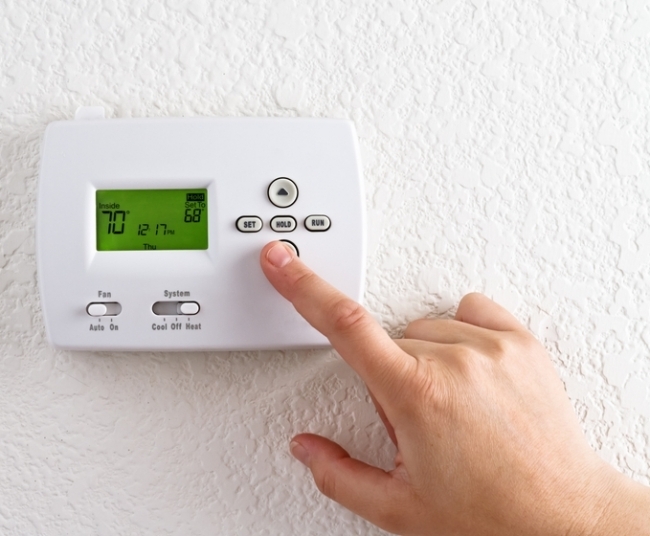 Many warehouses are not using programmable thermostats but could save a bundle in energy costs if they adopt them. Programmable thermostats can maintain zones so that each warehouse zone is only heated or cooled to required temperatures and schedules. A warehouse with older batt insulation is losing energy to the environment and paying for it. Traditional batt insulation can be replaced by more efficient spray foam or loose fill. Spray foam insulation is the most expensive but is twice as efficient as batt. Loose fill is a middle alternative that is easy to install in existing spaces and still provides superior insulation. Destratification fans are large, fixed fans designed to move a lot of air while operating at an energy-efficient slow speed. During hot weather, the fans cause evaporative cooling and can make a room feel several degrees cooler. In cold weather, the fans channel hot air downward to working zones, saving on heating costs. A demand-response energy program can be deployed with warehouse management systems to improve efficiency at all levels. Warehouse management enrolls with a demand-response company to create a feasible plan that allows the warehouse to curtail energy use during peak grid times. Warehouse management decides when and how to reduce use, so that business operates normally. The consumption savings across multiple customers form a virtual power grid that utility companies can draw from during emergency power situations. Customers such as warehouses are paid for participating in the program as well as for the energy they save. For a reasonable investment, a warehouse can deploy these nine tips and save significant cost while reducing its carbon footprint.